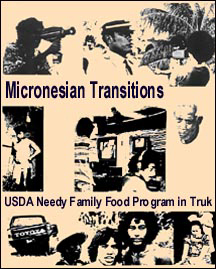 Part of the "Micronesian Transitions" videotape series from 1977 to 1983, this program examines the reasons for and the impact of one of the most controversial social projects in Truk (Chuuk) — providing USDA food to 99 % of the population. The advantages and disadvantages of the program are seen through the eyes of various segments of the society. Producer: Xavier High School, Truk. Director: Eric Metzgar, Instructor. Senior Town Study Project students: Nickson Bossy, Dennis Gaamed, Kris Johnson, Iosta Lodge, Benly Lucios, Chris Orrenges, Jacinta Rickat, and John Waathan.